GAYLORDSVILLE, CT – There are always those places in your locale that you continually pass by and just never really notice – until a heavenly smell comes billowing your way and draws you in. Enter The Old Oak Tavern. 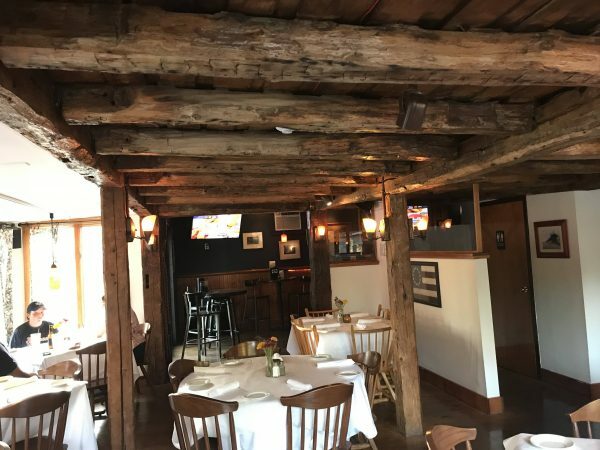 Established in 2016, it’s located at the southern end of South Kent Road, right off Route 7, but tucked away from view from the main thoroughfare. Feeling my stomach panging, I decided to stop in recently and investigate further. The parking lot had ample room for several cars and a nice, out of the way spot to tuck the bike. It appears the tavern is also investing in upgrading their outdoor seating with a new slate patio (not yet finished) in the rear of the establishment which will be a really nice addition for both the dining and bar crowd once it’s completed. Upon entering the tavern, I was warmly greeted by my server for the evening. I immediately noticed and appreciated the rough-hewn log beams in the main dining area and found a cozy table there to admire the craftsmanship. A few other couples were seated and seemingly enjoying their evening repasts. The bar area around the corner was inviting and lively with light music and several folks gathering to enjoy each other’s company on this night. The menu boasts traditional pub offerings and a few more upscale choices as well. From my initial olfactory draw, a burger was on my mind. The server also mentioned some very nice specials for the evening, so I added the steamed clams in a garlic wine sauce to start. The appetizer was quickly up and just as quickly polished off. 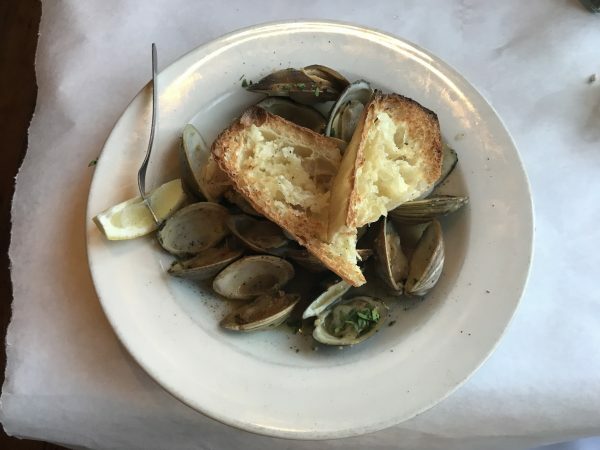 Toasted garlic bread accompanied the generous portion of hard shell clams in a savory broth. 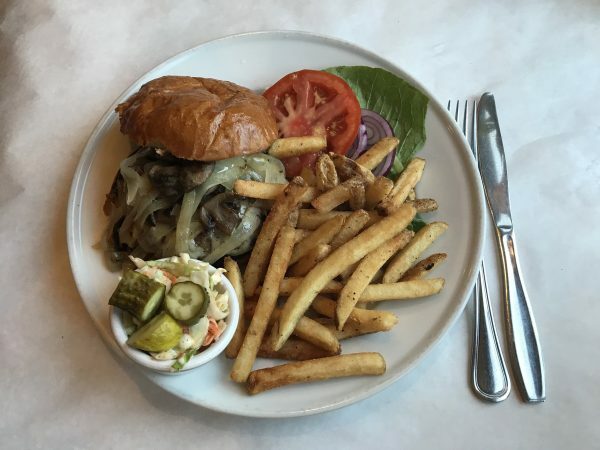 Shortly afterwards, the main attraction arrived – a mushroom swiss burger with sautéed onions on a fresh brioche bun – and cooked to perfection! The pub style fries were crispy and seasoned well and the coleslaw was a uniquely tasty addition to the meal. Though too full for dessert, I overheard the server giving options to the diners at the next table which included key lime pie – a favorite – if only there was more room after this wonderfully filling meal. 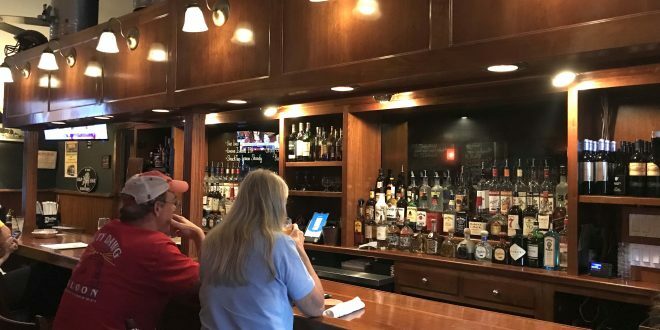 Upon receiving the check, the server was kind enough to explain a bit more about the tavern’s name which dates back historically to the period of our Country’s revolution – along with George Washington and his white horse – more on that can be found here. Sadly, the Old Oak that once stood near the tavern was lost in 2003 at over 300 years of age. But this cozy and welcoming pub will help carry on the story of this notable spot for some time to come. 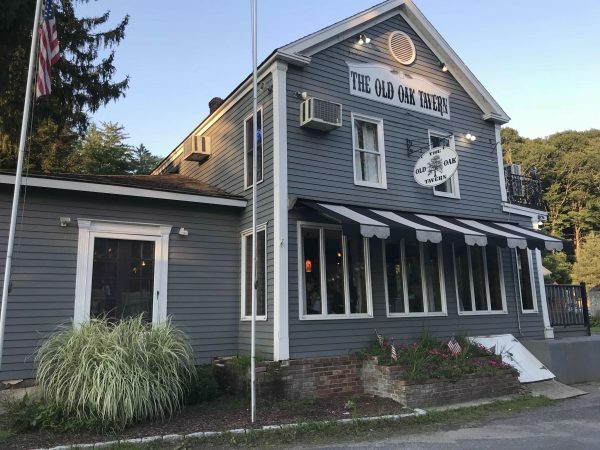 The Old Oak Tavern – a most pleasant local surprise and definitely a spot to come back to with friends in the near future. The bar opens at 4 pm. Monday through Thursday with dinner service from 5 to 9:30 p.m. Lunch is served from noon to 4 p.m. Friday through Sunday with dinner from 5 until 10 p.m.